Baby Jane Booties by Linda Cyr is just one of the many wonderful free patterns over at RedHeart.com. These knit booties will fly off your needles! Like many of you, I am often scrambling to find that perfect little something to bring with me when I go to a baby shower, or visit the newborn at the hospital. Since my friends know I crochet and knit they expect to have a handmade item, and rightly so! Well, these precious knit booties are perfect for the last minute baby shower gift! I just LOVE THEM! This video is part of my awesome new partnership with Red Heart and I can’t even begin to tell you how much I enjoyed working on the step-outs for this video. Now, you too can make these adorable knit booties with the free knit pattern and the free video tutorial taught by me, Marly Bird you will have nothing but success. These cutie knit booties are ones that every mom will love. The little buttoned Mary Jane style will keep them on even the wiggliest baby! Buttons, sewing thread and needle, OPTIONAL: sew on snaps. 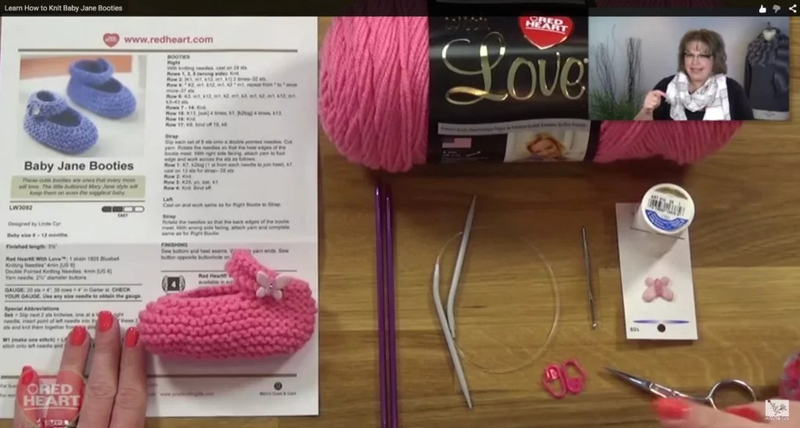 In this video you will learn how to increase stitches with a M1 which is also known as a make one. The M1 is a virtually invisible increase which is great to use in this garter stitch patterns. You will also learn how to bind off stitches mid row, cast on stitches at the end of the row and how to create a button hole. Last but not least I talk to you about adding a sew on snap in place of an actual button that is functional to make it easier on the mom, IMHO. Looking for more? I love making quick projects and even wrote a leaflet with Leisure Arts on how to do some fun things! If you too are looking for fun and quick projects go and check out the I Can’t Believe I’m Entrelac Knitting by Marly Bird. I just tried to download the video and it says it is private! The pattern is so cute thank you! I downloaded the pattern, but cannot view the video. It says the link is private. Can’t wait to see it, as I love your Craftsy classes!